Adjustable polyester strap. The main compartment has smaller compartments for cell phone and pen. 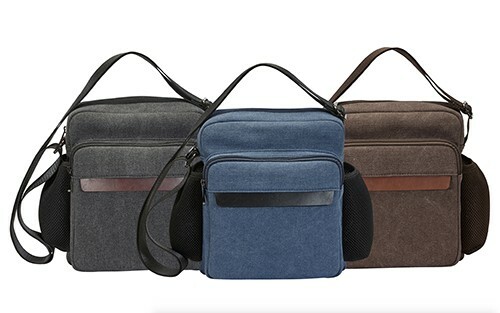 Bag includes two front pockets, one with a zipper closure and a smaller concealed open pocket (leather strip across front keeps items contained within the pocket). Side pockets hold items such as water bottle and small travel umbrella.